iMacsoft DVD Copy is fast and easy-to-use DVD Copy and DVD Clone software, which can copy DVD movie to DVD in 1:1 ratio perfectly, and compress DVD-9 to DVD-5 disc with excellent DVD copy quality. iMacsoft DVD Copy can easily get your DVD copies which remain 100% same to the original DVD movie Discs. The DVD Copy software can not only copy DVD movie to DVD folder or ISO file and backup DVD to your hard disk, but also burn ISO file or DVD folder back to DVD Disc. iMacsoft DVD Copy can copy DVD movies with any region code, it allows you to include or omit DVD menu, select subtitle and audio track, choose full disc or main movie separately to create customized DVD. Personalize and backup your precious DVD movies without fear of damage or loss. 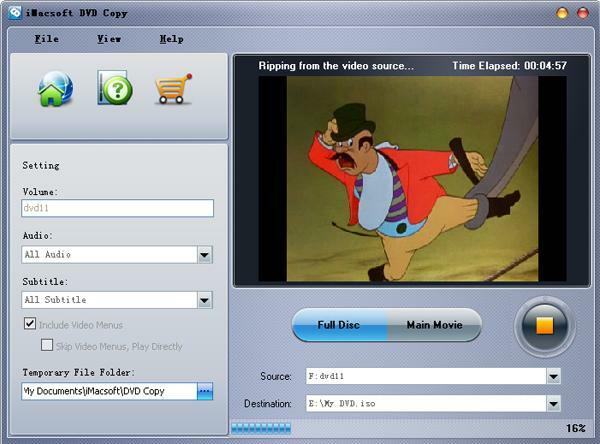 The DVD Copy software allows you to play your DVD movie on home and computer DVD players every day without worry about getting your originals scratched or damaged. You get disc protection with no loss of playback quality. How to copy ISO files and DVD folder to new DVD for backup? How to customize your own DVD when DVD copying?